This is one last thing after several posts about lawn alternatives and sort of a bleg. I’m quite taken with Nassella laevissima, a tussock grass from Chile, in a beautiful planting at the UC Botanical Garden. I’ve been to that garden a bunch of times this year, and that meadow always strikes me as just about the best thing in the entire garden. But I’ve never seen it growing anywhere else around here. 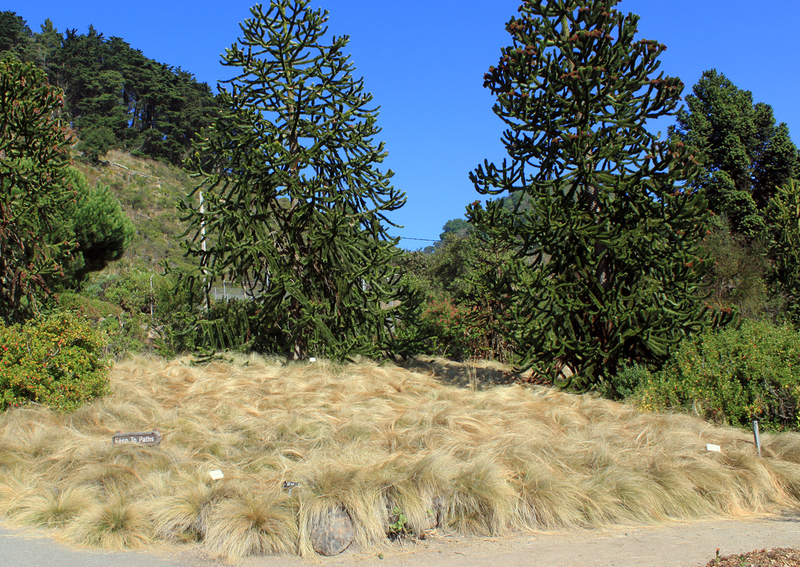 I probably saw it when I was in Chile fifteen years ago; I remember lots of beautiful grasses like this and it’s listed on the plantlists for some of the parks I visited. 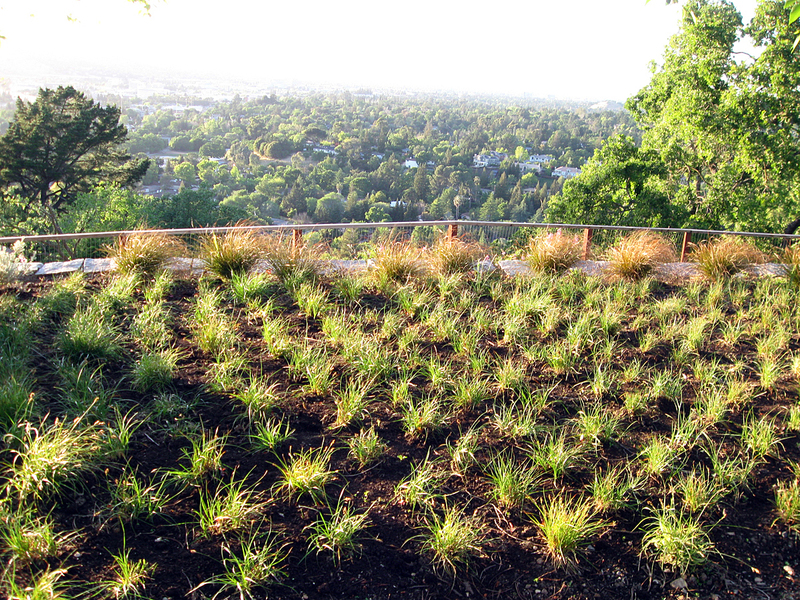 But no one seems to grow it here; I haven’t seen it in any of the new sod mixes, on any of the availability lists, at any of the specialty grass nurseries, or in anyone’s garden. Even online all of the photos are of this one single planting at the UC. I asked a friend who works at the botanic garden and she says it has been there for years and always looks this great with very little maintenance. Also, she says it doesn’t reseed like its poorly behaved relative, Mexican Feather Grass. So I’m just curious about why no one else grows it here in California. If anyone does know anything about it, please let me know. 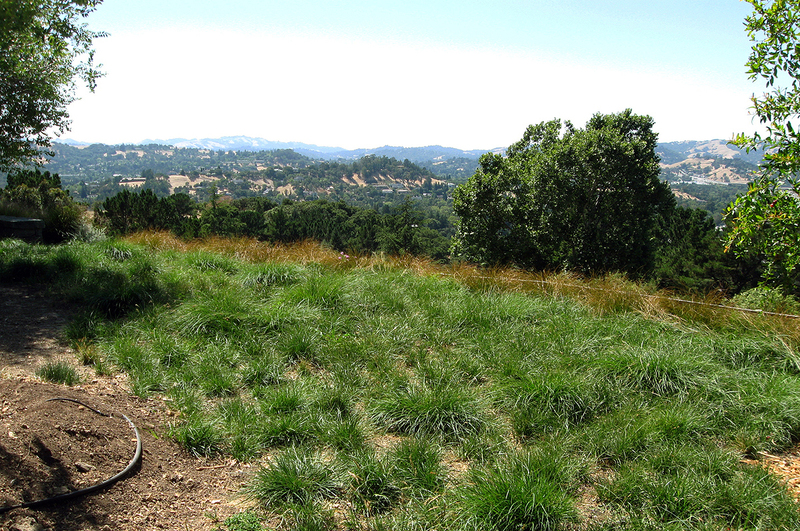 We recently checked in on a garden in Walnut Creek that we helped design and install two years ago. There’s a fair bit going on in that garden, but one of the things I was most interested in seeing was the Carex pansa lawn that we planted. 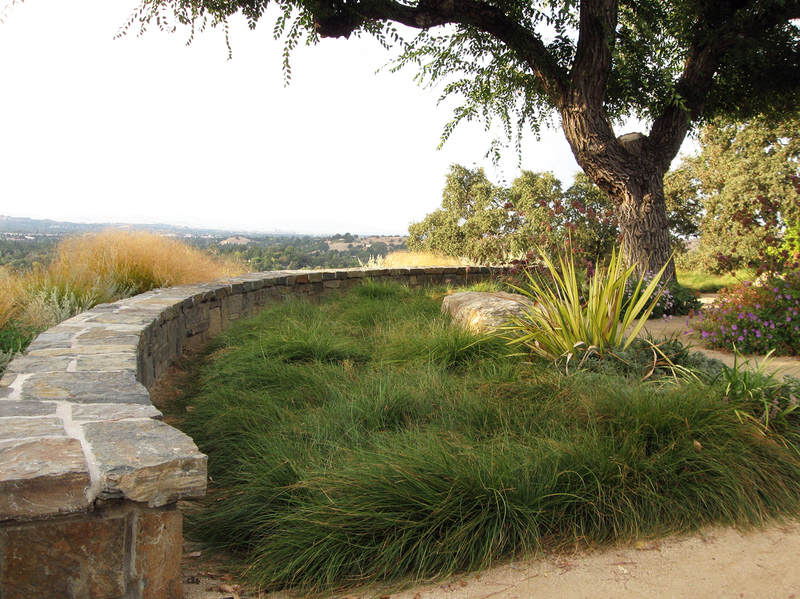 C. pansa is one of the main lawn alternatives that gets talked about these days. It was our first experience with it. So far, two years after planting, I’m pretty impressed. 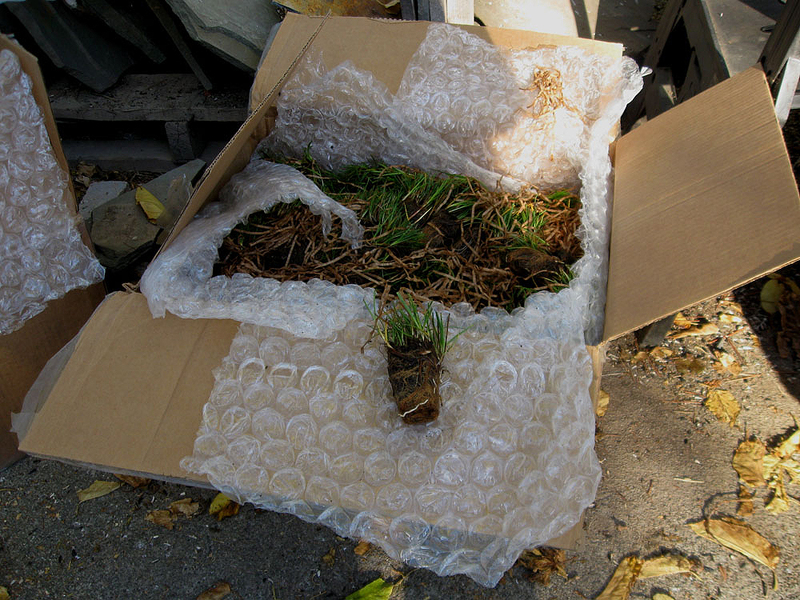 We planted it as 2″ plugs ordered from Greenlee Nursery (they have a great webpage for Carex Pansa). I’m not sure what I was expecting, but it was a surprise when some cardboard boxes showed up with the grasses stacked inside. I don’t remember how many, but it was somewhere around 2,000, and I ended up planting about half of them by myself. I had scheduled the planting on a Friday, but we got rained out and then I was too soft to make everyone come back to help me on the weekend. I averaged about one hundred per hour. Maintaining straight rows and regularly spacing seemed actually kind of hard. A quirk of this lawn is that it is watered with sub-surface drip irrigation. We were nervous that the plugs might not get their roots out in time to find the water, but we planted in November and they sufficiently established themselves by summer. Some of the plugs grew in quicker than others, and I’m guessing that’s because they were closer to the emitters. You can plant the plugs at six inch, eight inch, or twelve inch spacing depending on your budget and how fast you want them to fill in. We did eight inch spacing. The irrigation is managed by one of the weather-satellite/internet-based controllers that do all the thinking for you, so I don’t know how much water it’s getting at this point. Less than a traditional lawn for sure. 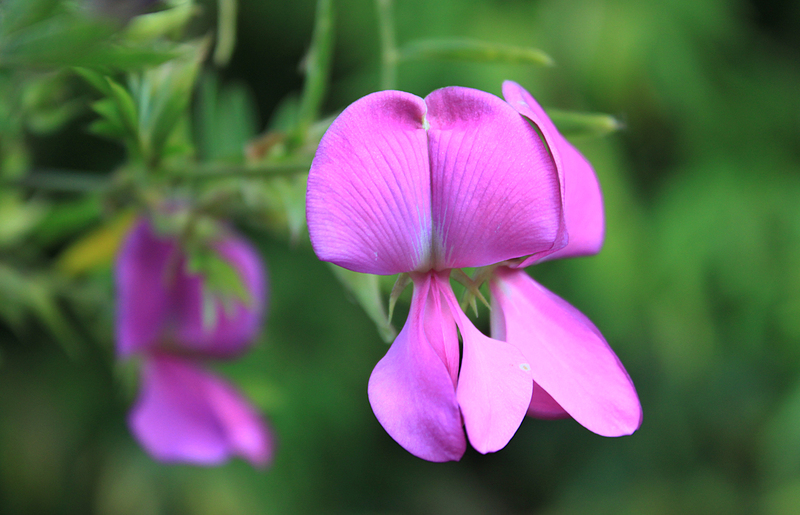 As part of the projects we’re doing in our garden, this weekend we took out our Indigofera heterantha. (The common name is Indigo Bush because one of the related species, I. tinctoria, is the historic source for indigo dye.) I’ve shown it in bloom day posts a few times. Kind of sad to see it go. Anita bought it on a whim five years ago to try it out, and we’ve liked it, though not quite so much that we’ve ever planted one for a client. It’s a good plant, with nice pea-family foliage and flowers, and it’s pretty much the best thing blooming in our garden this time of year. But it’s also the last plant to wake up in our garden in the spring and it gets a lot of dried-out twiggy stuff on the ends of its branches; people ask us if it’s dead unless we cut it back. I think people usually shear them to maintain a rounded form, but ours is shaded by our bamboo for part of the year so it has grown upright and leggy and we limbed it up to the shape of a very small tree. We liked it and would have kept it longer, but we needed to clear space to move our old garden shed. 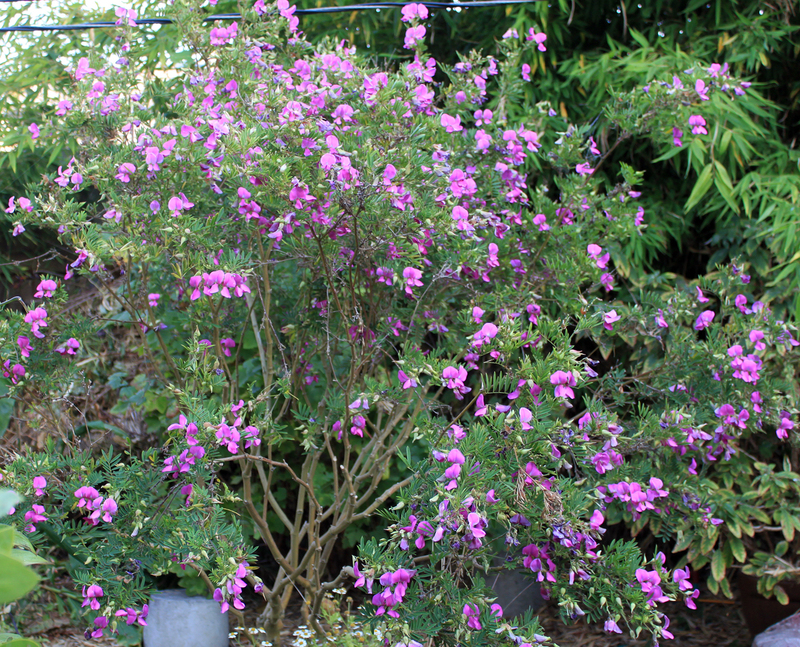 It was a choice between removing the Indigofera or the Dr. Hurd Manzanita, which isn’t much of choice at all. Sorry, Indigofera. Farewell. If you look closely at the photo above, you can see our old garden shed, hidden amongst the bamboo. 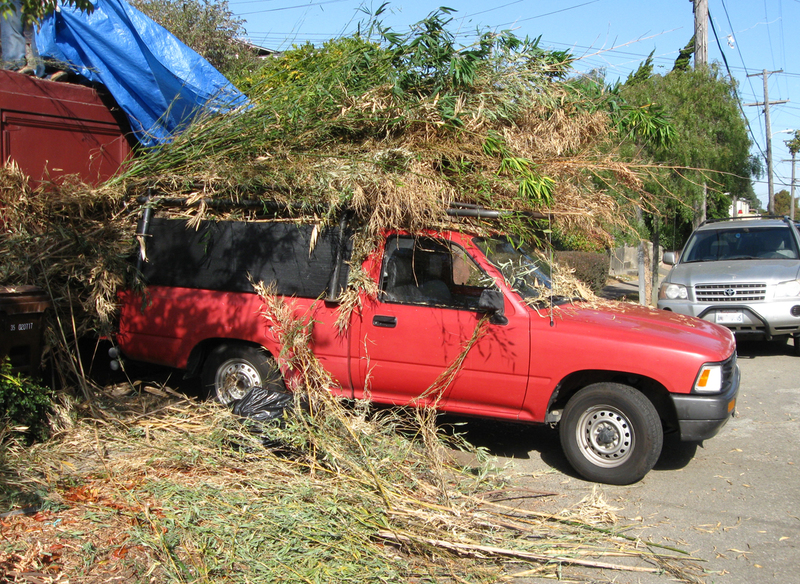 We cut down the bamboo and then rolled the shed out of there. 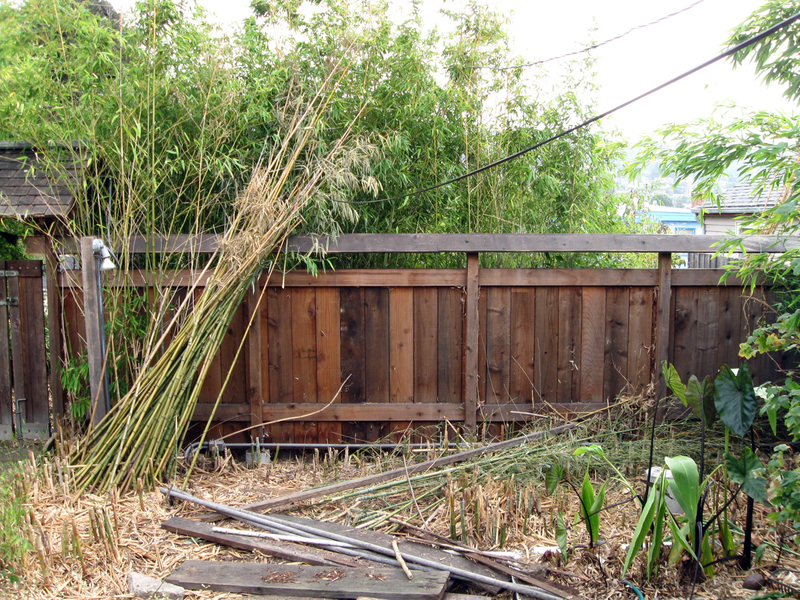 The poor Indigofera was blocking where we needed to move the shed, but it was the only casualty of the project so far, along with the bamboo which our garden can well afford. I’m not sure I’ve ever fully conveyed how much bamboo our garden has, but it’s a lot, like ‘open a restaurant for panda bears’ lot. It’s the defining feature of the garden, twenty foot high golden bamboo on all sides completely screening our yard from the neighbors. We did two loads like you see in the photo below, and that only scratched the surface. Town Mouse and Country Mouse have started posting photos of their gardens on the first of every month. 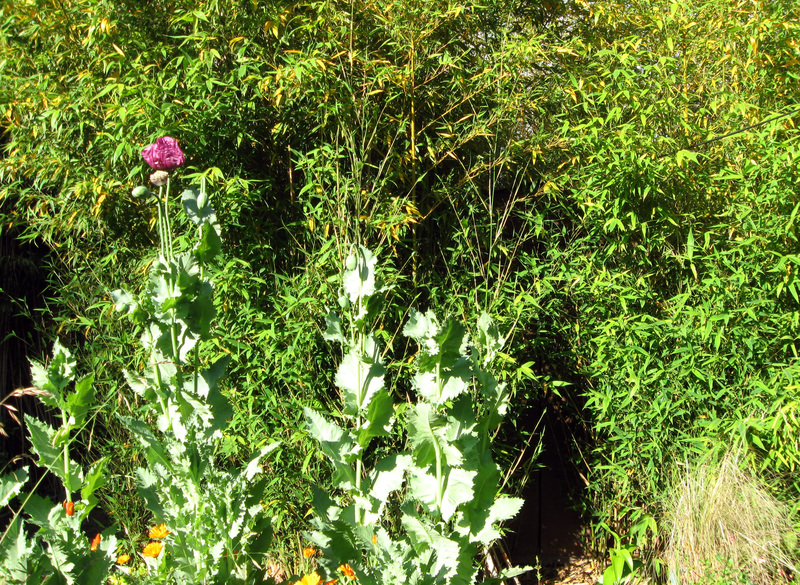 Below is the dominant view of our garden at the moment, the site of our old shed waiting for the next phase of bamboo removal, the not-so-fun digging phase. I’m not sure if we’ll have a new garden shed in this view by the start of next month, but we should be pretty far along. 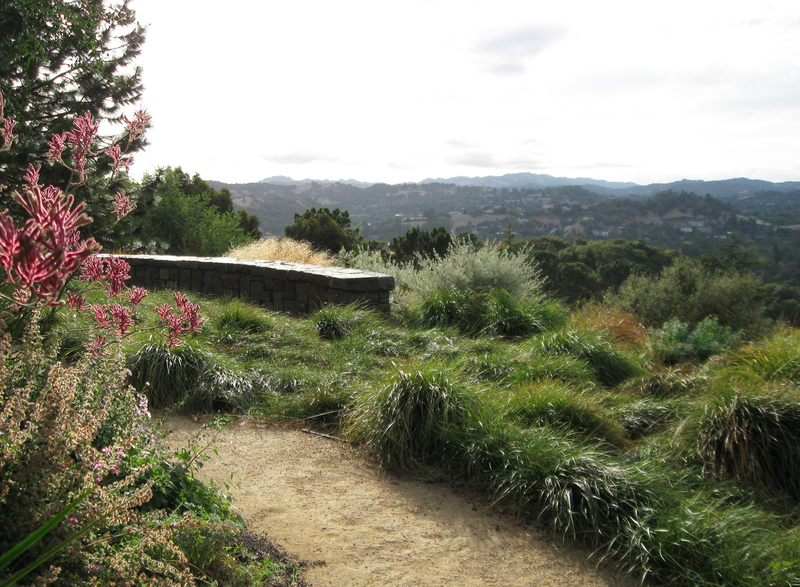 You are currently browsing the DryStoneGarden blog archives for October, 2011.